When I wrote about my $80 pajamas, I never imagined it’d spark a three-part series of articles. Yet here we are. Quality tends to come with a price. While there are ways to mitigate some of these higher costs — buy used, wait for sales, etc. — if you want to buy new quality items, you’re going to pay a premium. Because of this, quality is often something reserved for the rich. If you have money, you enjoy the luxury of being able to buy quality items (if that’s what you want). If you’re struggling with money, if you’re still in debt, then it may be difficult for you to prioritize quality over price. Like so many things in life, this is fundamentally unfair. But that’s how things are. This was the Captain Samuel Vimes’ ‘Boots’ theory of socioeconomic unfairness. That catch — the reason for this “socioeconomic unfairness” — is that if you’re poor and/or struggling to make ends meet, you cannot afford to pay for quality. You’re forced to choose the cheapest option…which is actually the most expensive option. If, on the other hand, you’re wealthy, then you have the luxury of being able to absorb the initial expense and allowing time to reduce your cost per use. Going back to my pajama example, I had been buying the equivalent of $10 boots. Each year, I was spending $20 to buy a new pair because the old ones were wearing out. Because I’m in a position to afford it, I decided to buy the equivalent of $50 boots. I spent $80 on high-quality sleepwear in the hopes that it will last years instead of months. Does all of this make sense? If not, maybe a graph or two will help. I spent thirty minutes producing the two lousy charts below. Despite the poor quality, I believe they do a good job of illustrating the boots theory of socioeconomic unfairness. Both charts cover a period of ten years. The red lines represent the total amount spent on boots during that decade. The blue lines — which are pretty worthless, I’ll admit — illustrate the cost per month. Here you can see that there’s a high initial outlay to buy expensive boots — but the total amount never changes. It stays constant over the decade of ownership. Meanwhile, the cost per month drops sharply. It’s very high at first, but eventually declines to less than fifty cents per month. At two-and-a-half years, the costs of ownership are identical. (That’s what my fancy arrows are trying to indicate.) At this point, the cheap path will have cost $50 — the same as the expensive path. The cost per month at this point is $1.67. After two-and-a-half years of ownership, the cheap boots become the expensive boots and the expensive boots become the cheap boots. From this point forward, the “cost-of-ownership gap” slowly widens with each passing month. By the end of ten years, it will have cost four times as much to purchase cheap boots than to have purchased the expensive boots. The cost per month for the cheap boots will be $1.67; the cost per month for the expensive boots will be 42 cents. Note, however, that there’s risk involved. The expensive boots aren’t automatically the better deal. If something happens to the expensive boots during the first two-and-a-half years of ownership — they’re lost, they’re stolen, they’re damaged, they’re destroyed — then they forever remain the most expensive option. The cost per month never reaches the break-even point. But here’s where another aspect of socioeconomic unfairness comes into play. We already understand that it’s tough for a poor person to save enough to buy the expensive boots. What happens if the boots are stolen after only one year of ownership? The rich person is frustrated, but she’s able to replace the boots (with another expensive pair). The poor person, on the other hand, isn’t able to self-insure. If the poor person’s boots don’t last thirty months, he’s doubly screwed. This is another example of how the rich get rich and the poor get poorer. Here’s the thing, though. Even if you’re struggling to get by, even while you’re trying to get out of debt, it is possible to prioritize quality with some purchases. You can’t spend a lot to buy the best every time you make a purchase, but you can absolutely target the items that are most important to you. I’m a big fan of conscious spending, the notion that you should give yourself permission to spend on the things that are important to you but cut back hard on the things that aren’t. In my own life, for instance, I recently opted to purchase a hot tub. This wasn’t an easy decision. Hot tubs are expensive. Building a deck to surround the hot tub is even more expensive. Yet I recognized that Kim and I would get a lot of value from owning a spa. And we have. In the five months we’ve owned it, we’ve spent over 500 hours in the thing! Our cost per use is still high — about $14 per hour — but it will decline with time. This is an example of a luxury purchase that’s aligned with my own habits and values. No, it’s not a necessity. But Kim and I are receiving a lot of value from this. These are examples of conscious spending in action. The same principle can be applied to deciding whether or not to buy quality. If there’s a tool you use every day, for example, one that’s an important part of your work or home life, then I believe it’s fine to pay more to buy quality. You might disagree, but I don’t view this as consumerism. In fact, I see it as the opposite of consumerism. You’re trying to buy less in the long term, not more. Let’s use the boots as an example again. If Vimes purchases the cheap boots, he’ll buy ten pairs and spend $200 over ten years. If he purchases the expensive boots, he’ll buy one pair and spend $50 during that period. Which option is embracing consumerism? Which is actually an example of frugality and thrift? After you’ve managed to build a nest egg, you have the freedom to apply mindful spending to most aspects of your life. You can buy $80 pajamas. You can buy a hot tub. You can spend more for quality luggage. You don’t have this sort of freedom if you’re struggling to get by — thus the “unfairness” portion of Vimes’ socioeconomic theory — but you can (and should) exercise mindful spending on a selective basis, for those items that are truly most important to you. Like boots. This week on Twitter, one of my followers took me to task. 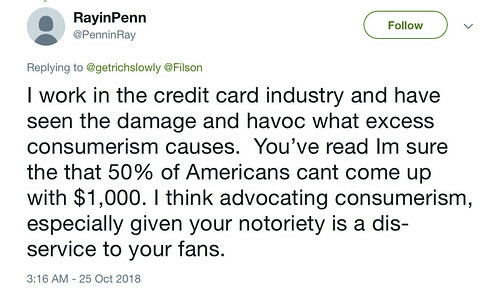 @PenninRay believes that by arguing in favor of high-quality, expensive luggage (and by purchasing a hot tub), I’m pushing people toward consumerism, that I’m working to undermine my own message. I disagree. There’s no doubt that Ray is correct when he suggests that consumerism — our obsession with the acquisition of Stuff — is a problem, especially for those who are still in debt or otherwise struggling with money. Where Ray and I disagree, however, is what constitutes consumerism. He seems to be arguing that certain purchases are always consumerist in nature. (I could be wrong here. It’s tough to get nuance on Twitter.) My argument is that, due to socioeconomic unfairness, what’s a poor decision for one person might be a fine decision for another. If this were 2003, if I were still $35,000 in debt, then buying a hot tub would absolutely be a foolish decision. But it’s not 2003 and I’m not $35,000 in debt. It’s 2018 and I have a substantial nest egg. It may not be fair, but I believe buying a hot tub — especially when that purchase is aligned with my habits and values — is perfectly fine for the J.D. of 2018 even though it would have been stupid for the J.D. of 2003. Perhaps, like Ray, you disagree with me. I believe that money is a tool. Like any tool, it can be used to build or to destroy. If you’ve managed to accumulate some cash, what’s the sense in having it if you don’t use it to improve your life? To me, that seems like having a workshop filled with tools that you never put to use. While it may not be fair that some folks have a workshop filled with tools and others don’t, if you do have the tools, there’s nothing wrong with using them to build the life you want. If you can afford quality and want quality, then buy quality. If you can’t afford it (or don’t want it), then exercise caution and restraint.